Mid Century Linen Postcard in Very Good, Unused Condition. 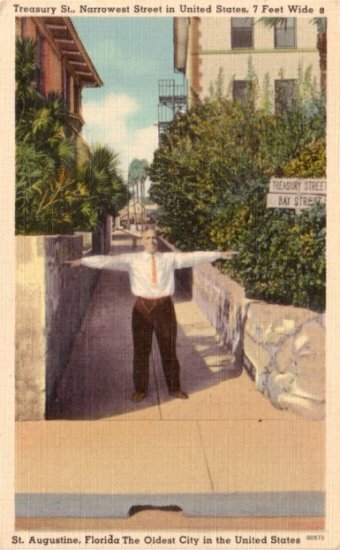 This post card was made by Tichnor Bros., Inc., of Boston, Massachusetts and published by Florida Souvenir Co., of St. Augustine, Florida. Narrowest Street in the United States, 7 feet wide. Once used as a highway, in Spanish period, this block preserved by the city as a historic feature. Three other blocks have been widened for modern traffic demands but here hands can easily clasp from opposite buildings.